Three; Five; Seven; Nine; '1' Wood; Three Wood; Putter. It's a starter set. I don't know who designed it that way, but when most of us started the game as kids, the powers that be wanted us to learn it with half the clubs. And those starter sticks weren't technological wonders either--they were probably made with melted down nineteenth century kitchen utensils poured into a standard mold the manufacturer had left over from 1940. And they were cheap! You probably could get a set for $50 at the nearest K-Mart--clearly an enticing introductory price to get you hooked on a game that costs big money to feed an ever-growing addiction later in life. If you could hit any of those starter clubs in the air as a beginner, it had to be Tiger Woodslike natural talent or sheer luck. Once swing basics are mastered and games improve, however, players begin thinking about the different distances each club is capable of-and wonder why there seems to be large 'gaps' in their set. Nothing like trying to hit a 'half' five iron because a seven isn't enough. At about this point, the time is ripe to get a full set. Once I'd advanced out of the starter set phase, I played with my Dad's Tourney golf clubs-blades. They were nice to look at-quite shiny-and I thought I looked pretty cool playing with nice clubs alongside my teenaged playing partners. But the heads were small-and not very forgiving. Not surprising for clubs that were manufactured in the early seventies. It makes me have great admiration for the forefathers of golf who could still shoot low scores using these tiny headed blades as their sticks. You just know that the pros had to match ball to the sweet spot nearly every time in order to get good performance with them. I wasn't nearly so talented. My next set was cavity backed and more in tune with the late 20th century. I noticed a fair amount of difference between them and Dad's Tourneys-mainly in the size of the heads and more friendly 'looking' than a blade--but I still wouldn't describe them as forgiving, or technologically advanced. My results weren't markedly different from using the older models. Face it, most of us need the clubs to provide the breaks that our golf swing won't. I went in search of a set that has a noted reputation for game improvement. 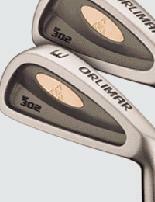 The search turned up the Orlimar SF 302 irons. I've seen the Orlimar advertising for years with the TriMetal fairway woods. Ken Venturi's been telling us about how powerful the design is-and emphasized above all else that the Orlimar set would help straighten the ball flight. That's exactly what I wanted to accomplish. And if twenty years of playing the game couldn't get me where I needed to go, then I'd start with an equipment upgrade. 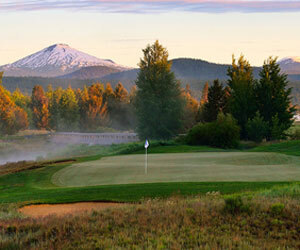 I've achieved greater average distance with the Orlimar irons simply because of its increased consistency. Orlimar says the SF 302 model is 'classic beauty in a game improvement iron.' Beauty is one thing, but I need the game improvement part. Mike Dolinar, Orlimar's Director of Marketing says the SF 302 is "A game improvement iron, designed for the average golfer who's looking to gain the feel of a forging-the SF 302 material is softer than a carbon-steel forged blade. But by casting it, it offers the forgiveness of a cavity-backed designed iron." Dolinar adds "It's for the average golfer who's looking for the ability to work the ball, and to have a good sense of the ball coming off the clubface-but to get the advantage of a cast club for forgiveness. The SF 302 is aimed towards making every player's game better, but also to provide high performance for good players." Dolinar says it's extremely important to concentrate the club's weight behind the ball in order to achieve maximum distance and accuracy. That's what distinguishes the Orlimar iron from the others. And the positioning of the weight on the iron helps with the player's visualization. I've used the clubs in five rounds thus far-and it's already helped quite a bit. Dolinar continues "Varying the mass of the weight increases forgiveness. If you mishit the ball-a little bit off-center, the ball struck with the SF 302 tends to work its way back to center. Again, it's a matter of getting the weight behind the ball where you need it the most." It's becoming the marketing cry of a number of the newer vintage equipment manufacturers that a straight game is optimal. Common sense, I guess. But Orlimar's emphasis has proven results. Including my experience. I've had a tendency over the years to be a tad too quick in tempo, resulting in an outside-to in-swing plane and pulling across the ball. I get an awful lot of toe hits, which usually ends up in a weak slice and soft distance. When the ball's not slicing-I'd often get a powerful pull to the left. No consistency, and my clubs didn't help me with the problem. The Orlimar SF 302 irons have already helped. I'm not saying they're like a magic genie in a golf bag that will automatically steer every ball towards the flag stick-but it's definitely brought more consistency to my game. The two most important categories -distance and accuracy- is where I'll comment. I've achieved greater average distance with the Orlimar irons simply because of its increased consistency-especially on the long irons. Since the weight is closer to the toe, my natural swing tendencies don't punish me the same way that my previous clubs have. The increased weight behind the ball, together with less of a tendency to weakly turn the clubface, have given me more 'normal' distance out of my iron game. And more 'normal' distance is greater than I had before-so yes, the SF 302 has increased my overall distance. But the greatest and most notable difference is accuracy. The ball feels much more natural off the clubface and has a noticeably straighter flight. I've been surprised to see the ball indentation on the club after a shot is still close to the toe, yet the shot's flown straight. It leads to a certain confidence in the clubs, which probably results in more consistent swings-because you're not worrying about getting it perfect every time. That's probably the greatest value in the Orlimar product-it allows you to make your own game better more so than the technology improves it. I'd certainly recommend the SF 302 irons to anyone looking for more consistency, distance and accuracy. I'd also recommend them for beginning players-especially at the expense of the traditional starter set. The only problem with having new players start out with these new clubs is-they'll have no idea how hard this game really is!